Nobody likes paying bills, but when you’re in debt every bill is like a minor heart attack. While there is no miracle solution for free money, there are simple things you can do to start digging yourself out of debt today. Keep reading to find out what they are. If you’re just making minimum payments on all of your bills, you may not have a good sense for how much you actually owe. Take the time to gather up your bills and compile them in a spreadsheet (or in a notebook) with the total balances and the percentage rates for interest. Add it all up to see how much debt you’re really in. Unfortunately, you may find that you owe more than you realize – especially if you have high-interest credit cards. Making the minimum payments on your credit cards and personal loans isn’t going to get you far – you’ll simply end up incurring more debt through accumulated interest. Take a look at the money you have coming in and decide how much you can afford to pay each month. Then, divide that number between the different debts, prioritizing those with the highest interest rates. Another way to do it is to create a list of all your debts, smallest to largest, then pay the minimum amount on all but the smallest. Pay as much as you can into that debt until it is gone then work on the next one. Nobody wants to be on a budget, but the truth is that sometimes it’s the best way to get yourself out of debt. You have to start by knowing exactly how much you owe and how much money you have coming in. From there, add in your other expenses such as rent (or mortgage), utilities, groceries, and gas. Decide how much you need to spend on each of these things each month then determine how much (if any) you have leftover for entertainment. Once you create your budget, really stick to it and keep track of your spending to stay on the right path. It’s very hard to save money when you’re focused on paying off your debts, but you’ll be glad you have it when you need it. Before you start tackling your debts, try to build a $1,000 emergency fund – do it in 30 days, if you can. You may have to get creative when it comes to saving, but if you put away a few dollars here and there and really cut down your spending for a few weeks, you’ll be surprised how much you can actually save. In fact, you may be able to save more than that! If you don’t have something to work towards, you’ll have a hard time sticking to your budget. 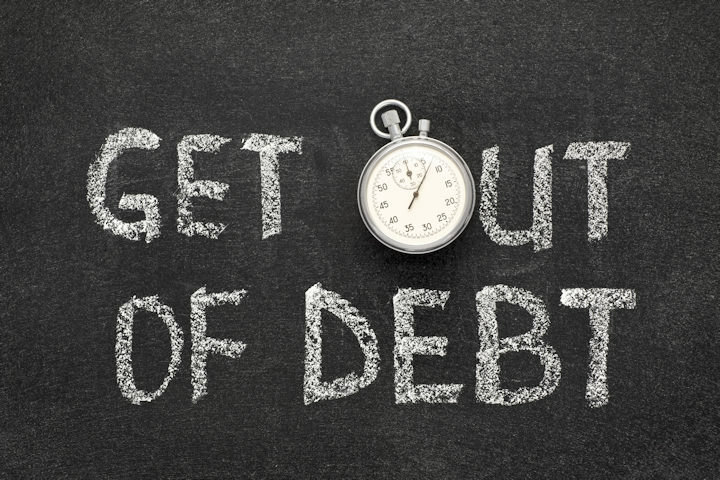 Before you begin, think about your motivation – why do you want to get out of debt? Maybe you want to save up money to buy a house, or perhaps you’re just tired of throwing away your hard-earned money on interest payments. Whatever your motivation is, keep it in the back of your mind each time you make a payment and know that you’re working toward your goal!